Designed with the latest technology for safe and ergonomic handling of cells and tissues. Controlled humidification with the chamber is possible by filling pre-filtered/sterile water in the special evaporation tray. Relative humidity(RH) set point to maximum 70% can be selected on the arm pad mounted touch screen. The air flow pattern of the Cell Tek chamber with its dual fan design offers improved air circulation and uniformity within the chamber. Silicon seals around the canopy openings give the chamber gas tight integrity and minimal environmental loss thus saving energy as well as CO2 gas. The instrument is located for stability and mobility on a rigid powder coated steel frame located on 4 castors with additional foot operated lift lock securing the instrument when in normal operating position. Provided with a high resolution stereo microscope with extended tilting binocular tubes as well as an integrated high resolution digital camera with HDMI output to a 10″ HD monitor. A LED illuminated(heat free) transmitted light base with titling mirror gives uniform illumination and special contrast effects for continual zoom magnification. Supplied with a low profile anti-vibration plate of 300 x 500 x 16mm high, with interchangeable isolators to suit various microscope weights and can be adjusted to counterbalance microscope weight. 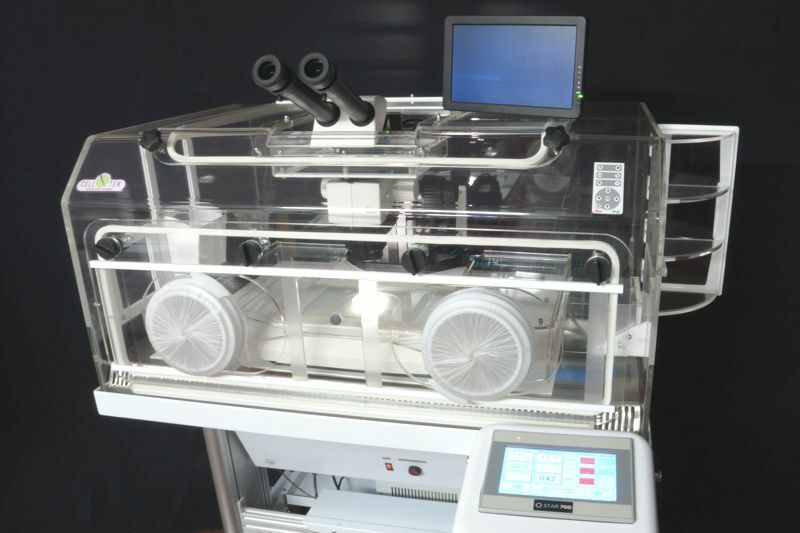 The Cell Tek 3000 IV chamber allows the scientist time to safely carry out procedures such as ICSI, PGD, embroys biopsy, assisted hatching and embryo assessment.